Stemcells can be converted in different lineages like osteogenic, chrodrogenic and adipogenic. To find cellular changes occurring such processes, one needs test systems so called assays. Such assays can be based on immunological reagents as well as molecular reagents. Genekam has developed a number of assays for detection of different biomarkers needed to verify these events. These assays are available as conventional PCR as well as realtime PCR. We are developing also assays on basis of nanotechnological methods. Not only this, such assays can be applied for studies involving cells e.g. osteoblast, chondrocytes related to bone formation and cartilage formation in other research works. We are offering at present osteogenic and chrodrogenic markers. Each marker has ist own importance during development e.g. collagen II is an indicator of cartilage formation, but collagen X is an indicator of hypertrophy of chondrocyte as well as terminal stage with MMP-13. Therefore each marker has its own importance and meaning, but a combination of other markers may indicate different meanings. To understand all mentioned here, one should have sufficient knowledge of histology, anatomy, physiology and pathology at least to interpret the results at research level. These assays open new opportunities for other laboratories for conducting fastest research. Such assays can be used also in clinical setting after clinical studies with them.Genekam will try to conduct such studies to get them approved for clinical applications. Alkaline phosphatase is an important enzyme elevating in a number of pathological events. Till today such enzymes are measured through biochemical assays, but variations in expression of Alkaline phosphatase gene in chronic kidney disease or other bone related events may be next clinical application of Genekam markers. Please note that our assays come with positive and negative controls against the assays in many publications, where many authors are using rodent or murine oligos to test human targets and these assays donot contain any positive controls at all. These assays are not at all validated to be of human origin. Such nonscientific issues can be found in many of publications applying hydrogels as well as nanofibers as the authors never validate their assays, therefore our assays can be used an alternative. Even some authors source commercial oligos, but they are being run without positive and negative controls, even no validation. If you have any doublt about the results, you can ask us to do genesequencing to recofirm the results. Genekam assays come in ready to use form. One needs only RNA, which can be converted in cDNA, which is basis of further studies. This can be done through cDNA synthesis kit. The results can be seen as band in gel agarose or as curve in realtime PCR. 1. Genekam Human Osteogenic markers (conventional PCR): The kit contains all components needed to run the PCR. Not only this, they have positive and negative controls. Components: Mastermix, dNTP, Oligos, positive conrtrol, negative controls as well as generuler + instruction manual: The results can be shown on gel agarose PCR. Genesequencingservice is available at extra charges to be reconfirm the results. We can offer you the kits with 100 reactions, please ask for the prices for them. Genekam Human Osteogenic markers (realtime): will be ready shortly. 2.1 Genekam Human Chrondorgenic markers Panel I (conventional PCR): The kit contains all components needed to run the PCR. Not only this, they have positive and negative controls. Components: Mastermix, dNTP, Oligos, positive control, negative controls as well as generuler + instruction manual: The results can be shown on gel agarose PCR. We can offer you these kits with 100 reactions, please ask for the prices for them. Genekam Human chondrogenic markers (realtime): will be ready shortly. All chondrogenic markers will be available as realtime too shortly as they are being prepared. 4. 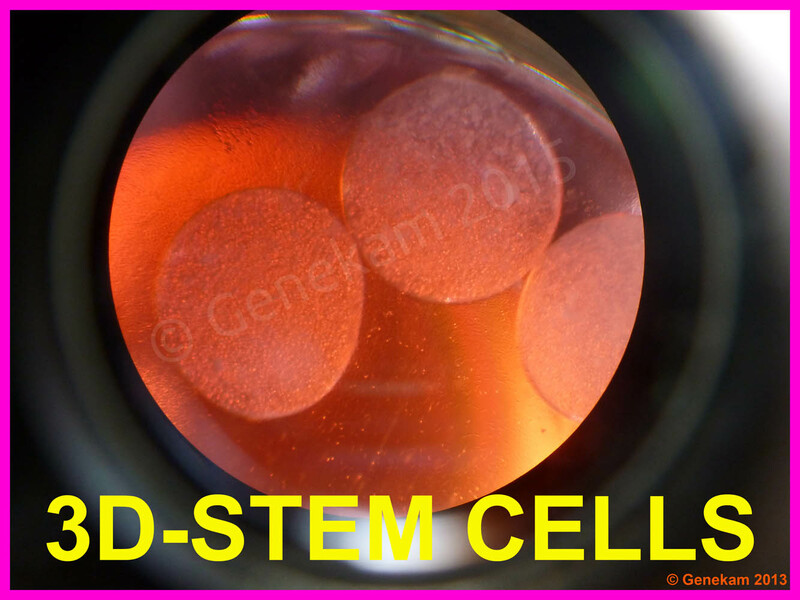 3D-Genekam-Bullets: 3D-Genekam-Bullets are 3D structures in form of small balls, which contain stem cells. Such structures can be used to conduct toxicity studies on stem cells. Even they can be used to see the effect of different chemicals on stem cells or other kind of cells e.g. growth promoting media, growth inhibiting media as well as carcinoogenicity of substances on stem cells. 3D-Genekam-bullets have a number of applications in medicine as they can be used to demonstrate the students: how the stem cells grown in 3D structures and how they behave? One can also test the interaction of such cells with other cells in the surrounding media in 3D-structures. It is well known that cell behave differently in 3D against 2D. Moreover these bullets can be used for Master, Ph.D. and post students. There will be many laboratories around the world developing different kinds of media to promote the growth of cells particularly stem cells, hence these bullets can be used to study these effects. Not only this, one can add differentiation media to see whether they can be converted in other lineages e.g. osteogenic or adipose, hence these bullets will give to access every laboratory in the world to do research work on stem cells. These bullets can be analysed with methods ranging from simple microscopic observation to complex 3D assays using nanotools. MSC cells are available from pig, human, ruminant, mouse and avian sources. One needs CO2 incubator and laminar flow to work with these bullets. They will be shipped in our media containing animal components or they can be delivered in customer specific media. 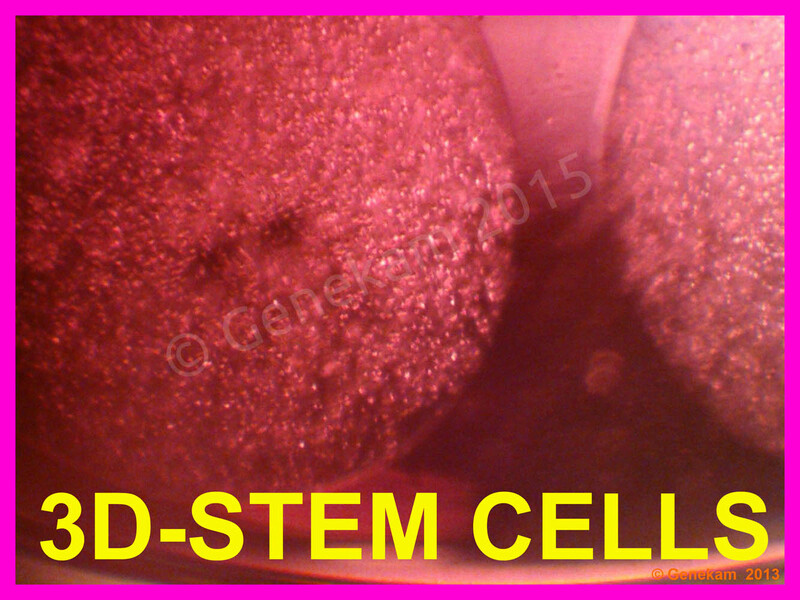 We can also manufacture also customised 3D-Genekam-Bullets with custom specific cells. Even we can conduct also studies on different kinds of chemicals on such bullets in form of a project. 5. We have developed some products to stain the above said bullets. You can observe the cell growth with microscope for daily performance. 6. G-Bullet lyser: As there are cells inside the G-Bullets, hence one need to lyse the bullet to get these cells for testing e.g. PCR, IFA as well as flowcytometry. Hence we have develop a lysis solutions to get some cells for study of the markers through molecular, immunological as well as nanotechnological tools.